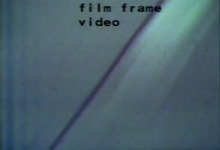 Three video propositions investigating the relation between language and image. Originally U-Matic tape. Merit Award, Athens Video Festival, 1980.